Glasgow and Scotland welcomed the world with an Opening Ceremony that featured celebrities from around the world alongside thousands of local talent in Celtic Park on Wednesday evening. The ceremony featured more than 1,300 volunteer cast members, ranging from eight to 85 years old and representing every local authority in Scotland, and was inspired by ‘a desire to put people and communities at the heart of the Ceremony’, according to Glasgow 2014. The evening featured appearances from Rod Stewart and Amy Macdonald who appeared with hundreds of Glaswegians as backing singers, as well as Susan Boyle alongside South African soprano Pumeza, comedian Karen Dunbar, signer John Barrowman and Nicola Benedetti accompanied by the Big Noise Orchestra and Eric Whittacre and his Virtual Youth Choir. 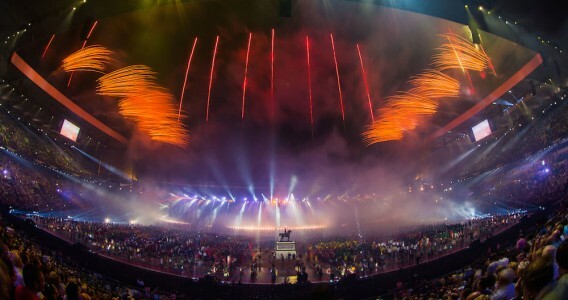 For the first time, the Opening Ceremony also included a call to action for the audience, the athletes and the Commonwealth to Put Children First. In a break from tradition the teams were welcomed by their region rather than in alphabetical order as part of a UNICEF campaign woven into the night’s proceedings. Hosts of the last Games in Delhi, India were the first into the arena representing Asia, followed by the teams from Oceania, Africa, the Caribbean, the Americas and Europe. In between each of the regions making their entrance a special video was broadcast on the huge screen running the length of the South Stand, which featured stars such as Sir Chris Hoy, Sachin Tendulkar, Colin Jackson and Sir Alex Ferguson. The videos highlighted the work been done by UNICEF projects in each of the six regions of the Commonwealth, and Hoy and Scottish actor James McAvoy called on the watching millions to pick up their phone and text a donation, with UNICEF revealing that over £2.5 million had been raised from UK donations alone by the time the Ceremony drew to a close. Meanwhile, the Queen’s Baton made its way on its final leg of the journey helped by adventurer Mark Beaumont, UNICEF friend from Jamaica, Jennica Stirling, and finally Sir Chris Hoy. Her Majesty the Queen read her message which has travelled 190,000 kms since 9th October last year, traversing the Commonwealth until finally coming home.